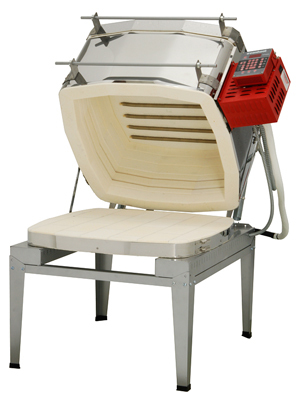 The Evenheat Studio Pro 24 builds on Evenheat's Dual Access Design and offers the glass artist a large studio kiln uniquely designed for full, unrestricted access. The TAP Controller allows for wi-fi connection via our well placed USB and ethernet ports. This connectivity allows the artist to monitor the kiln, develop and edit programs and perform TAP Controller functions from a networked computer, tablet or mobile device. Web based apps are expected to be available Dec. 2015. The Evenheat Studio Pro 24 features front and top access, a wall-free design, Rampmaster control with Swing View, wonderfully large handles and lift assist all wrapped up in a well engineered design. Like the Original Studio Pro, the design of the Studio Pro 24 was driven by the demands of glass work. Glass work is a fairly active process. It relies heavily on visual cues, opening and closing while firing, fast action and all sorts of movement. It's a lot of fun and the Evenheat Studio Pro 24 only adds to the enjoyment. It doesn't hinder, compromise or get in the way. This large studio kiln just works well. The Studio Pro 24 also works very well in the more traditional firing styles such as metal clays, low fire ceramics, enamels and china painting. While not as active as glass, these types of firings do require a kiln that's properly designed and built for use. Since the Studio Pro 24 is an Evenheat design, you know you're getting that as well. The Evenheat Studio Pro 24 will fire any ware up to 1800°F (982°C).